Cautiously, I never deem a book with the superlative “this is the best thing I’ve ever read,” just like I resent putting an arbitrary star-rating on a book,which I believe is bound to change, depending on my reading mood at a specific point in time. For this reason alone, I refuse to say S.A. Hunt’s The Whirlwind in the Thorn Tree, a proverbial diamond found in the rut of the wide pool of various self-published novels out there, is the best thing ever (because there are too many books like that, especially things I’ve read this year..) I am very picky, when it comes to choosing things to read in the fantasy genre because the fantasy genre can prove to be something that either artistically succeeds, or fails miserably, and then ceases to be only forgettable, formulaic drivel. It is a trying task for a fantasy novelist to write a novel that incorporates different archetypal character and plot structures, and provide an intriguing, hopefully ingenious gloss of unconventionality, to set it apart enough, to make it stand out in an overcrowded market of fantasy novels, which invariably get shelved, by the genre purists/dogmatists, into “genre ghettos,” never to be seen by the curious, inquisitive reader, hoping to find a read that defies genre standardization. For the most part, self-publishing has been a boon to the general speculative fiction writer, who can write speculative, wildly imaginative fiction, that can coexist among different genres, even those generally agreed to be mutually exclusive, rather than mutually inclusive. 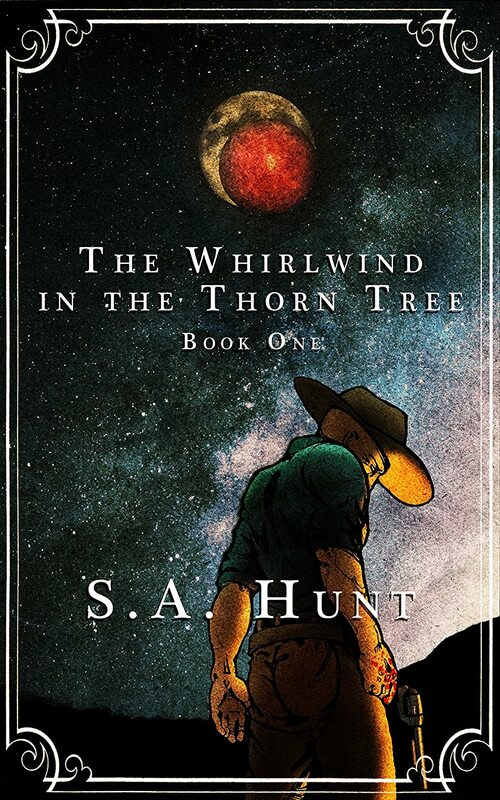 S.A. Hunt’s The Whirlwind in the Thorn Tree book is really a writer I see fitting in with the high-caliber adventurous speculative fiction writers, like David Mitchell or Lev Grossman. Both these writers released their own highly creative books, which I felt were exceedingly strong contributions to the literary world, as both their respective works -Lev Grossman’s The Magician’s Land and David Mitchell’s The Bone Clocks- were unafraid of experimentation, nonlinear plotting, or confusing, yet ridiculously clever inclusion of simulacrum (in adeptly written fantasy fiction, “simulacrum” has a deeper role than just “superficial representation of something).. In their works, the nonsensical pastiche of different fantastic visuals or plot devices may seem to be superficial or linear, yet they belie a much deeper psychical reality. And their pastiche is more nuanced, enigmatic, complex, unlike the deceptively instructional machinations of allegory. How does S.A. Hunt fit into this oeuvre of sorts, of other speculative fiction writers, who excel in writing this hard-to-define form of post-modern fiction? Well, it is reductive, and even disingenuous to S.A. Hunt’s own artistic accomplishments, with the first novel of his Outlaw King series, to just lump him in with those two writers. But S.A. Hunt has a very deep,impressive grasp of how to shape evolved, interesting, and deeply psychological works, much like both Lev Grossman and David Mitchell, that really lend a psychical dimension to language, or at least tries to. The basic story may be the journey of one character, named Ross, trying to uncover the mysterious legacy of his father, who wrote a series that held numinous meaning for the fans of the work, including two characters (who later become cohorts or friends later in the first book), who have a very deep,almost religious grasp of the inner workings of the book series that Ross’ father writes. And I better stop myself, from getting too far with this discussion of exactly what happens in the story. From my other reviews that I have written, I have a lot of trouble writing details about stories, for reviews, mostly because I prevent myself, unconsciously from doing so, to really try not to spoil the rich, cathartic, deeply engrossing (and emotionally empowering) experience of reading through any book, especially an interesting, infectiously creative book like this one. The voice of the main character is pronounced, well-developed, and complicated. S.A. Hunt never skimps, fortunately, on plumbing the psychological depths of his main character, or exploring the ramification of being a writer, in a post-modern world. This is a question, explored through The Magician’s Trilogy,in a quasi-existentialist discourse on the purposefulness or meaning of magic, in a rational age. The same discussion, with a wholly different angle, is taken up, very subtly, throughout The Whirlwind in the Thorn Tree, exploring the philosophical depths of “what constitutes an imaginary idea, or why do humans even have this faculty to imagine things?” Is this ability, intrinsic to self-conscious beings, something vapid, or inane? Was it the chief role of storytelling, in a world where the range of our emotions, to help us better understand the emotions that help enhance our ability to relate with reality? By a writer with less talent, these things could have become pretentious and overwrought, particularly in a story, with hackneyed character development? This is not a polemic, this story utilizes the rich art of subtle storytelling, the ability to believably shape an entirely different reality, apart from our own, that feels mysteriously tangible and emotionally palpable, in a world, where we sometimes question whether our own main reality, isn’t of that same surreal substance of a story. It is best to read this book in uninterrupted silence and concentration, much like with David Mitchell’s The Bone Clocks because it is a book that has more than just extremely clever linguistic wordplay, unsparing imagination, and great cultural references sprinkled in at just the right intervals in the story, to really get you more involved with the story (one culture reference is referred to in the GIF image, taken from Labyrinth, above). It is a novel that will invariably linger in your subconscious, forevermore. It is nice to drown into the wonderfully refreshing pool of a sea of dreams, made up of disparate fantasy tropes, etc. all winded together into a bizarrely cohesive whole, entitled The Whirlwind in the Thorn Tree. It’s time to get myself out of this trance of mine, and remember that there is a sequel awaiting me. Mighty Leaf Tea’s Organic Cafe Orange tea, which will set your uneasy, stress-filled mind, at ease with a nourishing, and intoxicating blend of fine black tea, orange herbs, and potent Mate. Much like The Whirlwind in the Thorn Tree’s own unconventional blend of inter-dimensional narratives, this tea crosses the dimensions of the mundane realities of tea and coffee, which you might have mistakenly thought were mutually exclusive things. When you need something that invigorates the creative faculties of your mind without stressing you out or perhaps giving you a sour stomach late in the day, it is this strong, refreshing tea blend, which is really the closest thing to “Chocolate Orange Tea,” that is the best alternative than being trapped in the indecisive mind-set, of not knowing whether to choose coffee or tea for your long reading marathons of this book. Mighty Leaf’s Organic Cafe Orange Tea is the literary tea blend that is best recommended to put you into a philosophical, cerebral trance, suitable for reading The Whirlwind in the Thorn Tree, as this tea is quite the trippy blend, for meditative fantasy-novel readers. THANK YOU TO MIGHTY LEAF TEA FOR SUPPORTING THIS CONTEST. FOR INDIE AUTHOR APPRECIATION MONTH! !